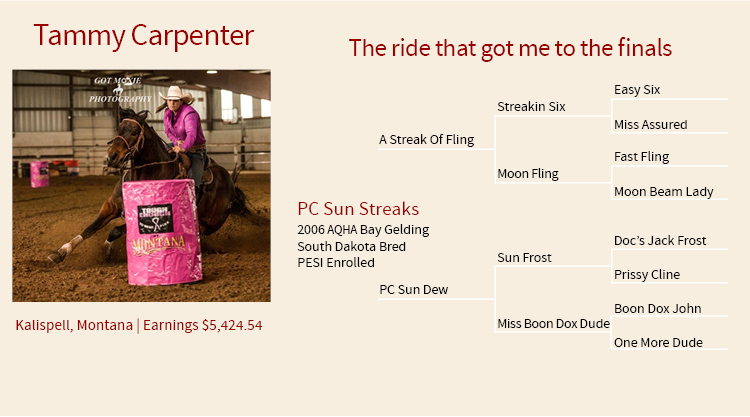 Which horse(s) are you taking to the finals? What is your horse(s)' style when running barrels? What specialqualities does your horse have and what makes him/her unique? He is a free runner but very turny. He is very calm, laid back and lazy. But just prior to a run, he comes to the top and can be a handful. What is your riding/training schedule with your rodeo horse(s)? I like to give him a day off after a series of rodeos and then just light exercise when not competing. What is your favorite part of barrel racing and the rodeo lifestyle? I love training horses and the competition of rodeo sports. I'm especially proud of what Obie and I have been able to accomplish together. What is your favorite inspirational quote or saying that you use to keep you going during the year?